The mussel shooters here are the perfect starter to your sushi or ramen meal. Chef/owner Mike Fukumitsu boasts a 20-year career as a Japanese chef in Utah and Japan, including a long stint as a sushi chef for Kyoto Japanese Restaurant. Five years ago, he purchased Kobe Japanese Cuisine in the Olympic Hills Mall and has been serving up melt-in-your mouth sushi and made-from-scratch ramen ever since. It takes more of a slurp than a bite to consume the entire contents of each half-shell mussel in one glorious mouthful. The appetizer, at $5.95, includes two shooters filled with a mixture of chopped green-lipped mussels marinated in soy sauce, sesame oil, citrusy ponzu and a kick of spices. 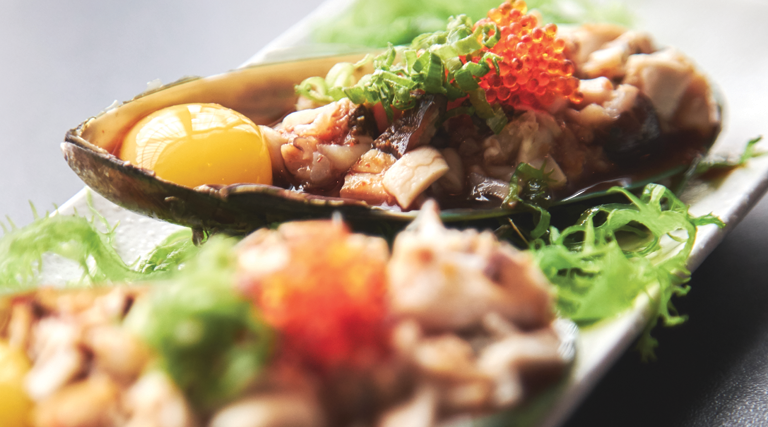 It’s topped with tobiko (flying-fish roe) and green onions that add crunch and freshness, and the yolk of a raw quail egg nestled in each shooter coats the entire bite with velvety richness.